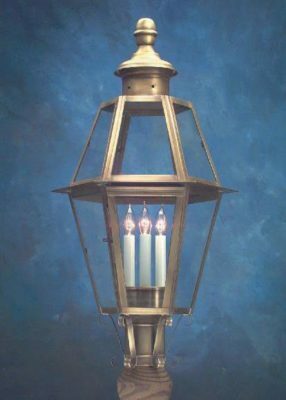 We design our Handcrafted Colonial Post Lanterns to provide a glowing warmth. 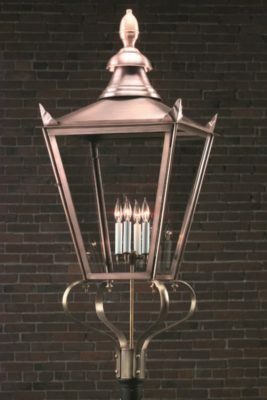 Yet the beauty of solid copper or brass Colonial post lanterns also provide you with a dramatic accent in daytime. 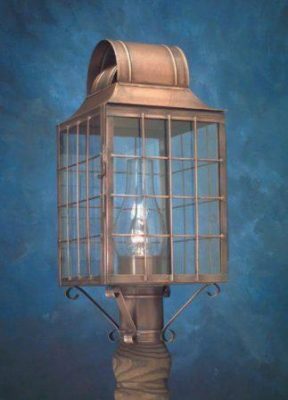 Colonial Reproduction Post Lanterns were the staple of outdoor illumination, lighting the streets of cities and towns throughout Early America. 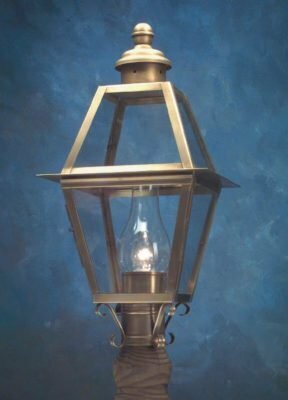 Due to the quality and accuracy of our Colonial post lanterns, they are often chosen for municipal and historic restoration projects throughout the U.S.
At Hammerworks our craftsmen handcraft all Colonial Solid Copper Post Lanterns. 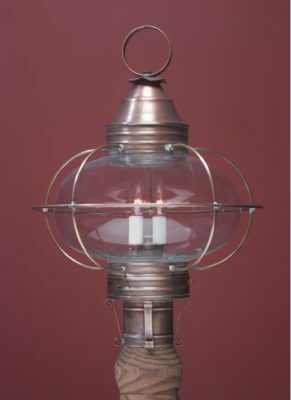 Each of these copper post lanterns is meticulously handmade with attention to detail and historical accuracy. 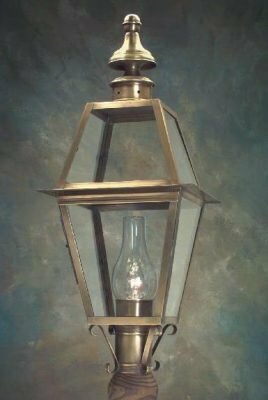 This process recalls the days when early Colonial craftsmen took pride in their work. 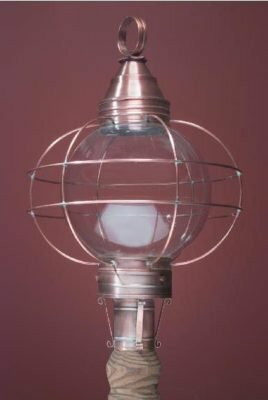 Each lantern they produced was a testament to their community for years to come. 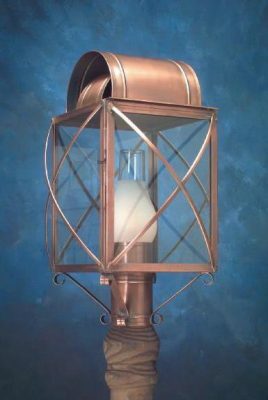 When choosing size and quantity of post lanterns, consider these factors: Do not shy away from size, as the light may appear undersized if not scaled properly to the setting. 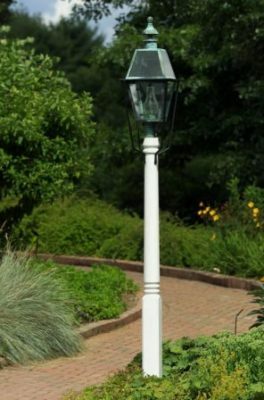 The distance from the post light to the building, as well as the building size itself determines which size post light is appropriate. 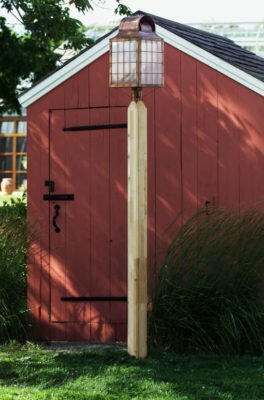 On a long driveway, multiple copper post lanterns may be necessary, to achieve proper illumination as well as aesthetic value. 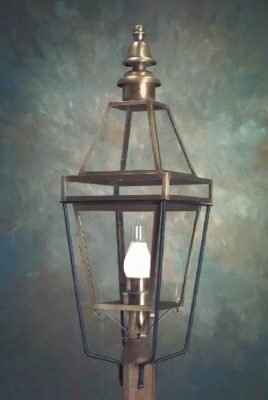 Each Colonial reproduction post light from Hammerworks is solidly constructed in your choice of material. 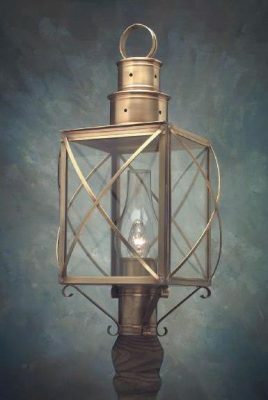 We use the same methods employed by our colonial ancestors. 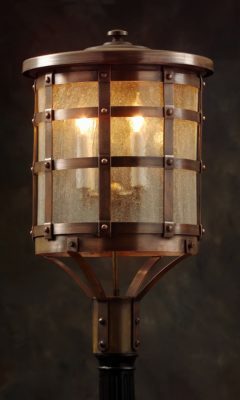 The hand rubbed antique copper and brass finish gives the light fixture an attractive satin patina, allowing it to oxidize naturally over time. 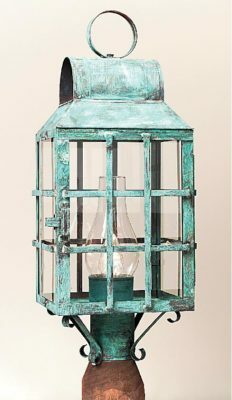 If you prefer, we can apply a Verdigris Copper finish giving your post lantern a more weathered look.